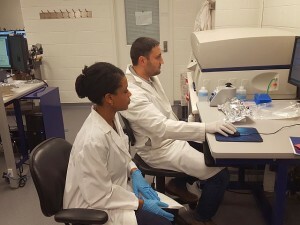 University of Toronto’s Faculty of Medicine Flow Cytometry Facility has served as a vital resource in supporting academic research for over 30 years by offering a wide range of services for current and prospective clients at the University, its partnered research institutes and other academic institutions. The facility is staffed by two expert technicians, one full-time and one part-time, who between them have 20 years’ experience in the field. 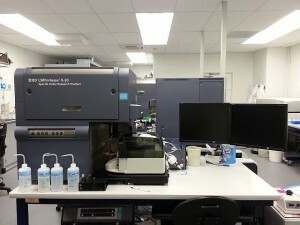 Our technicians are primarily responsible for the daily running of the lab, which includes conducting cell sorting and data acquisition experiments for clients, analytical instrument training, general instrument maintenance/troubleshooting, data analysis, experimental design and general flow cytometry consultation. Their broad knowledge base can be relied upon to help our users design complex polychromatic staining panels and trouble shoot common (or not so common) acquisition problems in order to achieve consistent and beautiful results. The recent CFI award to Dana Philpott for the Host – Microbiome Research Network included funds for the facility enabling the purchase of two BD Fortessa X20’s, a BD Influx Cell Sorter plus several smaller upgrades to existing equipment. We now have a total of seven Becton Dickinson brand analyzers ranging in capacity from 2-laser, 4-colour systems to 5-laser, 18-colour systems, plus two cell sorters. Our newer instruments are laser and filter matched, so in the event of instrumental failure backups are available for seamless data acquisition and minimal downtime. The facility operates on a cost recovery model where fees collected go towards technician salaries, supplies, online scheduling software, instrument service contracts, emergency repairs and small, but necessary upgrades. The fees collected by the use of any one resource are pooled to support the facility as a whole and are distributed as needed to ensure the smooth functioning of the lab. Apart from user fees, the facility also has partial support from CFI until 2019 and receives operational support from the Department of Immunology. By using the facility, investigators gain the advantage of having access to many well maintained instruments, a team of experts to support and advise on flow cytometry related research requirements, reliable instrumentation, competitive fees and confidence in their data. For detailed information on our equipment and service offerings please visit our Instruments, Services and Training pages.